La película “El Gran Hotel Budapest” gana cuatro Oscar 2015 a la mejor: Banda sonora original, Diseño de producción, Maquillaje, Diseño de vestuario. Desafortunadamente los premios a la mejor Película y mejor Director recayeron en otros films, pero el homenaje a nustra profesión, sin duda alguna, lo ha entregado esta inolvidable película, por lo que el corazón de los conserjes del mundo le concedemos el Oscar de nuestra Amistad. 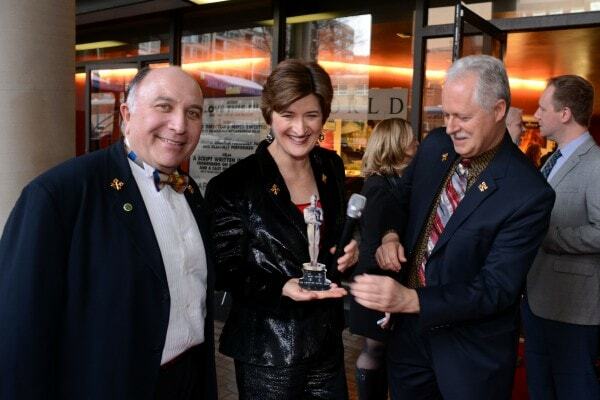 Jack Nargil of the Mandarin Oriental, Julie Saunders of the Four Seasons, and Michael McCleary of Willard InterContinental at the D.C. Oscar celebration for Les Clefs d’Or at West End Cinema on Feb. 22. On Sunday, while Oscar-goers donned their designer duds and Oscar-watchers in pj’s popped their popcorn and gawked from home, a small group of local hotel concierges hosted a special red carpet of their own. More than a dozen local concierges, who cater to the wishes of the well-heeled at four- and five-star hotels around town, gathered at West End Cinema to watch the big show (yep, all four hours of it) and cheer for “The Grand Budapest Hotel,” which was nominated for nine awards. The film, directed by Wes Anderson, is a high-stakes comedy about a hotel concierge charged with murder who tries to prove his innocence while still providing for his hotel and its guests. For many of Sunday night’s attendees, the film, which stars Ralph Fiennes, Adrien Brody and Bill Murray, was something like a stamp of approval. In “The Grand Budapest Hotel” — which won four Oscars on Sunday — Fiennes is a member of the “Society of the Crossed Keys,” a fraternity of concierges that helps other members at all costs. In reality, there is an international group of upper-echelon concierges with the same brand of camaraderie called Les Clefs d’Or. (Don’t even bother having John Travolta try to pronounce it.) Les Clefs d’Or is French for “the golden keys,” and members wear two crossed gold key pins on their lapels. The men and women whose job it is to work magic behind the scenes were finally getting their chance in the spotlight. But not for long. The clock would eventually strike midnight. Esta entrada fue publicada en Tu sección. Guarda el enlace permanente.